Music director A R Rahman is straddling two worlds, a national one and another, international one with equal aplomb. He has scored for the upcoming Hollywood flick Million Dollar Arm which will hit the screens this Friday. The interesting fact about this Hollywood film is that it has a Tamil song in the background which is Thirakkadha Kattukullae from En Swasa Kaatrae that featured Arvind Swami and Isha Kopikar way back in 1998 and was sung by Unnikrishnan and Chithra. Rahman is quite happy about the inclusion of the song and feels it is apt for the film. 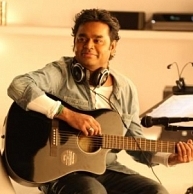 Rahman’s impending projects in Tamil include Shankar’s Ai and Vasantha Balan’s Kaaviya Thalaivan. While superstar’s Kochadaiiyaan scored by Rahman is all set to hit the screens this Friday, the 9th May, he would also be scoring for Rajinikanth’s next Lingaa. When asked about Lingaa, Rahman says, “It is too early to talk about Lingaa but a Rajini film is always special”. People looking for online information on A R Rahman, En swasa kaatre, Million Dollar Arm, Thirakadha Kattukullae will find this news story useful.